Make sure you read the next post because I just wrote it right before this one. Due to technical difficulties, I lost a previous post, so I am trying to recreate an abbreviated portion of it. While Janell’s mother Stephanie was here we made a brief church history tour. We visited Nauvoo and Carthage. It was a beautiful day, so we took the horse and buggy tour the church provides for free. Apparently, the Asian lady bugs thought it was a great day too because they were flying about in swarms that day. We could not walk more than a minute outside without having a few landing on us. 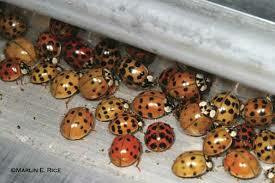 essentially they look like regular lady bugs, but are bigger, multicolored, and are massively more numerous. The Nauvoo residents called them corn bugs and the Iowans call them Chinese lady beetles. I looked it up. The Iowans are right (not to mention handsomer, more sofisticated, and better at football). They are particularly pesky since the tour guides told us they bite. Anyway, they never bit us although one climbed down my shirt and a few got in Janell’s purse and flew out in the car. Now back to the trip. It is always a spiritual journey to visit Nauvoo. One day we will take a more thorough tour, but this time we had to hurray to make it to Carthage before it closed. That jail house was an exceptionally sacred place. I was very surprised by how much they kept original, including the door with the bullet holes. It was there that the prophet Joseph sealed his testimony with his blood. I highly recommend visiting both places. Enjoy the photos. Horrah for thanksgiving! I don’t have class all week. It is going to be great. We bought a small turkey and have decided just to do thanksgiving on our own. It should be really fun, since we have never prepared a turkey before. Lillia is doing well. She is sleeping more and more. She is just about 9 pounds now, which is good for her. Her next sergery is on the 2nd of December. The poor girl has to go through so much so early in life. In a way it is good, because she may not remember any of it. We really do have a lot to be grateful for. Anyway, Janell is happily sleeping at the molment, so I will have her share or write something later. Uh oh. Lillia is starting to shout. Thank you for visiting and have a happy thanksgiving! Well she ate and went back to sleep. Exceptionally rare. So, two weeks ago we celebrated halloween late by decorating spooky gingerbread houses we bought an post-halloween clearance sale. We would have saved them for christmas, but the icing holding the houses together was bright orange. The candy bats tasted great. You can probably guess which one was mine. Anyway, the video page is now up and we will be periodically adding things to it. If anyone finds any neat videos, please let me know and I will post them. (rated G only).